★EXCELLENT ELECTRIC SCOOTER – Important tips: Press the folding latch when folding and unfolding it to avoid equipment damage, and please do hold parts nearest to the folding latch if you want to hang around with it’s folding state. This high-end scooter is equipped with a 5.2 AH high capacity battery, it will ensure distances of up to 8-15 km riding after a 3 hour charge. It is made of strong carbon steels, and can bear a maximum weight of 198.4 lbs (The weight of an average adult). ★LOAD SPEED – The scooter has a maximum speed of up to 11-14 km/h in first gear, 17-21 km/h in second gear and 26-27 km/h in third gear. Speed will slow down along with the battery life get dropped, which was decided by the voltage, so it’s normal to have a lower speed than expected when it’s power is low. Speed will declined when it’s uphill, and the angle should be less than 20. ★TRUSTED BRAKE SYSTEM – The red one on the left will brake and the black one on the right will accelerate so it is very simple to use. The scooter will decelerate gradually when you press the brake. To keep your scooter from scratching there us a kickstand included which will keep it upright without falling over. It’s not suggested to depress the lid of the rear wheel often, cause it’s not extreme scooter. IP55 waterproof level ensure secure driving when it drizzles. ★ADJUSTABLE SUPPORTING BAR – The height can be adjust from 32.2-inch to 36.2-inch, and there is a height adjustment clip used for fixing. The wheels are made of natural rubber, which will give a smooth ride with built in shock absorption on the front wheel and it’s pretty solid . It sports a large anti-skid deck for a very comfortable non-slip ride. There is an information display screen to show the current speed, battery level, odometer and the driving time. ★BRIGHT FRONT HEAD LIGHT – The scooter is equipped with a front head light so he can ride in low light conditions as well. The illuminate distances up to 78.7-inch. 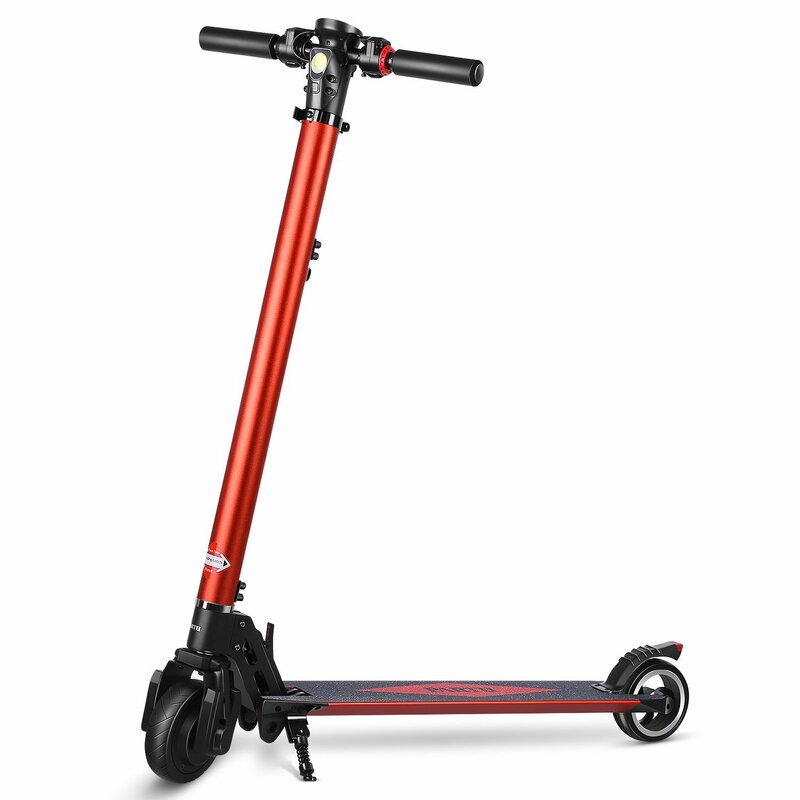 All components are totally new and well made, and each scooter was tested before shipping .Offers 24-month warranty, quick replies in case of problem, and instant refunds. Please email us if you have any questions. This scooter can be used as a great transportation, which suit for teenager and adults. 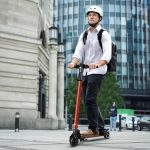 Why you should buy this electric scooter? ✓Distances of up to 8-15 km riding after a 3 hour full charge. 1、This electric scooter is waterproof which can ensure driving when it drizzles, but your engine will be damaged if you drive it in heavy rain or on the road where water depth over 0.8-inch . Helmet is highly recommended which can keep your safety. Average Load and speed when a 65kg person is on the scooter: Its speed is up to 14 kph at first gear, 21 kph at second gear, and 27 kph at third gear when driving straight. Charging and pavement conditions may affect its speed, and this is the performance when fully charged. When no one is on the bike the speeds are: 0-18kph at first gear, 18-25 kph at second gear, and 25-33kph at third gear, give or take a 5 kph error. Where could I find replacement handles for partu electric scooter?